1. Is this some kind of joke...ceramic teeth? 2. Am I really going to get two free, premium sawblades? 3. 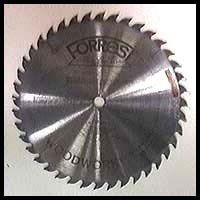 At the very least I would have a spare Forrest Woodworker II saw blade for my saw! I now have only one thought: How can I get these guys to take the Forrest in exchange for another ceramic-tipped blade? After having compared the two blades for about 3 weeks I wrote to Tom Walz for some background info about what I now think of as a revolutionary product. Please read on as I believe this could be the next "insanely great thing" in the woodworking world. What is it? The material is made sort of the same way tungsten carbide is, but saying this is almost the same as saying picnic tables and grandfather clocks are made the same way. The material is called Titanium Carbonitride (notice the word "Titanium") and is sintered the same way as tungsten carbide using the same process, molds, and dies. The different materials result in a product called "cermet" (at right in photo), a metal based ceramic. Because the manufacturing process is basically the same, the same variety of products found in tungsten carbide can be be produced in cermets. What are the advantages? The companies' research found the blades were sharper, cut easier and stay sharper longer. In commercial applications they were found to run quieter, cooler, and feed much more easily. How easily can they be serviced? Because the blade tips are manufactured basically the same as tungsten carbide, any reputable sharpening service can do the job required (see footnote for more specifics). What about the blanks? The company is talking to several saw manufacturers about licensing the product. This process is still in the sensitive stage and no details were given. How much? The cost is projected to be about 30% higher than tungsten carbide blades now available and are projected to be on the market by the end of the year. Universal Saw & Tool can make any blade you desire now for about double the price of a carbide blade(Toll free 1-877-438-7427). End of background. How did I like it? Two words - Bee's Knees! I jammed about 200' of wood(walnut, yellow pine, sassafras, poplar, red oak, cherry) into both blades and the ceramic blade outperformed my beloved Forrest blade hands down (on the bottom at left). The cuts were smoother, less binding, and MUCH more effortless with the cermet blade. I even cut a casehardened piece of walnut(firewood) that required wedging with both blades and the cermet blade hardly took a deep breath. Conclusion? I have used the Forrest blades exclusively for about 20 years. The only time the new ceramic blade will not be on my table saw is when it will be sent away for sharpening. The good news is it will need to be sharpened much less frequently than my carbide blades. Remember that word? Titanium! The review was done on a Delta contractors saw with a 30" Unisaw fence. The runout on the Forrest blanks was .0015". The saw was tuned prior to first use and not touched until the end of trial. The wood had a moisture content of 6-9%. The wood thickness ranged from 1/4 to 6/4 mostly in the rip mode. 24 tenons were cut. All operations were equally divided between the two blades(What a pain!). Ken is my woodworking neighbor. After he spoke up for the blades Chuck had wrangled for our reviewing process, I suspected I would be called upon to take some pictures. That's OK, at least I would get a chance to try some new tools and make a few cherry statue pedestals at the same time. After Ken finished his evaluation, I borrowed the blades for a trial run in my shop. Unlike Ken, who is a woodworking purist (no particleboard for him!) I headed these blades at such taxing materials such as MDF, Melamine and plywood. These materials have glue in them which causes the heat needed to erode the cutting edges. I was hoping several days cutting up man-made panels would indicate the better of the two blades - more on that later. Initial impressions were very favorable towards the Cermet blade. Maybe you can't notice in the above pictures but it's very obvious to the naked eye; the Cermet teeth are much more polished than those in the stock Woodworker II. This proved out in cleaning where the built-up pitch sorta popped off the Cermet teeth with only a light scrubbing with Fantastik spray cleaner. After a few preliminary cuts, I was also impressed with how easily both these blades ripped through composite materials - even at angles. This was no surprise - the 60+ toothed blades I usually use will always be slower than the 40 tooth configurations from Forrest. Of course, there is usually a sacrifice in cut smoothness and neither of these blades were an exception. Unlike Ken, I was less sure about which blade cut smoother. If I were forced to choose, I'd select the Cermet blade but picking one or the other would have been splitting hairs to me. In any case, using these blades to cut out the parts for the MDF boxes was a cinch. After a week of busting up panel stock and before giving these blades back to Ken, I made two final cuts in melamine thinking maybe the condition of the bottom edge might be a clue as to which was really the sharpest or more durable blade. The results are at left and I can only say I could see no difference. Both blades left the same measure of unacceptable chips in the bottom edge. With their aggressive rake, these blades aren't designed for this application and to my eye, they both failed equally. Wrapping up, it's my opinion these two blades are still plenty sharp and the proof is in a pudding which hasn't gelled yet. 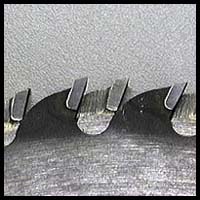 It seems entirely probable, for us small-time woodworkers, to run these blades for a year or more before one or the other really stands out as a superior or more durable cutting material. At least that's my impression - yours might be different. I really did like the tooth configuration chosen by Forrest and could see many applications for these blades in my cabinetmaking. These mitered corners in cherry-veneered MDF came out pretty good. The edges weren't as smooth but feeding the stock through the saw was a lot easier. If you're burying an edge in a glue-line, who cares if there are a few tooth scratches no one will see? The following is an email exchange between myself and one of the WWA members; readers of this review might find it helpful. Jim, your comments regarding melamine chip out with the cermat blade and the standard Forrest Woodworker II should have recognized that the Woodworker II was never intended for the cutting melamine panels. Nor is it the correct blade to be used on the cherry veneered MDF panels. Forrest makes the HI A/T blade for this purpose. 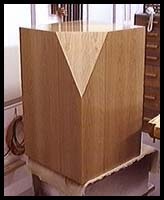 While I recognize that the only real comparison that you could make was with the Woodworker II and the cermet blade, some readers might get the impression that you recommended the Woodworker II for use on hardwood veneered panels. 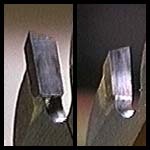 "Both blades left the same measure of unacceptable chips in the bottom edge. With their agressive rake, these blades aren't designed for this application and to my eye, they both failed equally." If it wasn't obvious in the text, the only reason I used melamine for this test was to indicate sharpness - not as a serious application of the blade. Maybe you recall the recent FW test of router bits where they quantified the sharpness of the bits with the number of melamine chips per foot. Such was my intention. 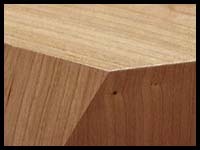 Though I found this to be true with MDF cherry, I feel I've debunked their claim for a "SMOOTH-AS-SANDED [edge] surface" with my other comments in the review. Still, let's look at a comparison of the two Forrest blades, OK? Thanks for the input! If you want, I can post your email to the same web page along with my response. Let me know, OK? The test using the melamine panels is an absolutely valid procedure. I only thought that you should have added a short sentence or phrase that would make it clear to the neophyte, that the blade is not designed for melamine panels. I understand that, and you understand that. A lot of folks don't understand that! And now, you've got me started on Forrest's claims. I have reviewed Forrest's latest ad in Fine Woodworking, April 2000 issue. The ad contains the flawed claim of "...making short work of one-sided laminates and splintery oak plywoods... flawlessly...." I have learned some time ago, never cut any hardwood veneered engineered wood panel without Forrest's Duraline HI A/T blade in the saw. However, the "smooth-as-sanded surface" is attributed to Wood Magazine article. I own three of the Woodworker II blades and three of the Duraline HI A/T blades. One of each is new, the others were all sent to the factory for sharpening and making a test cut (extra charge). All six perform admirably, but not quite as stated. The Duraline HI A/T will cut Panolam's Carnation White melamine panel virtually chip free, but not "PERFECTLY" Panolam's Oxford White melamine panels chip profusely. The Carnation white is Panolam's premium grade, and is more expensive. Local suppliers can usually fill an order for a full unit (34 sheets of 3/4"). I switched to the Forrest blades after years of unsatisfactory performance by others. I don't see any brand switch in the future. You may certainly post my comments! To sharpen cermet tipped blades a saw shop needs a heavy, stable, precise grinder, special grinding wheels and cermet specific techniques. The wheels are different but they are available so they work well on the better grinding machines. The process requires removing the wheels used for grinding carbide and replacing them with the cermet wheels. The special techniques required for cermets are basically attention to speeds and feeds as well as temperatures and coolant cleanliness.